Bombay Sapphire gin is a premium gin in which ten herbs have been processed. The herbs together with the distillation in copper kettles make Bombay Sapphire a specific taste. Two of the ten herbs used are malaguenan pepper and tail pepper, herbs of which the Bombay Sapphire gin complex becomes subtle. For the gin tonic mix, Fever Tree Lemon tonic has been chosen, a tonic with a fresh lemon flavor that perfectly combines with the gin. Who wants to taste Bombay Sapphire or wants to convince others of the special taste of Bombay Sapphire gin, we recommend buying this miniature package, who already knows what he buys, can also choose the large package in which Bombay Sapphire and Fever Tree Lemon tonic are brought together . 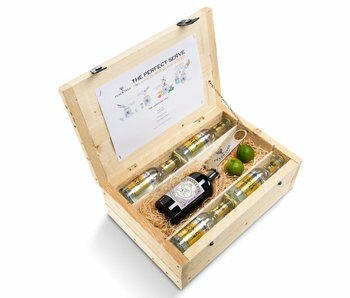 The Bombay gin is delivered together with the Fever Tree Lemon tonic, liquorice and opener in a luxurious wooden gift box. With our packaging we make original gifts that can be used for example as a promotional gift. 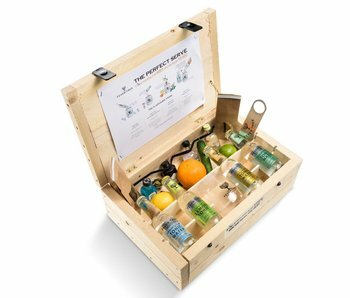 The box contains an instruction that makes it easy to assemble a Bombay Sapphire cocktail.